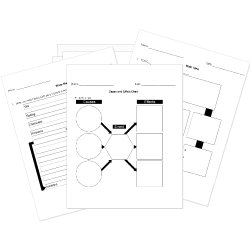 Check out our pre-made Reading worksheets! You can create printable tests and worksheets from these Grade 6 Making Inferences and Drawing Conclusions questions! Select one or more questions using the checkboxes above each question. Then click the add selected questions to a test button before moving to another page. In the years before the American Civil War, there was a federal law that allowed slave owners to reclaim their escaped slaves. Anthony Burns was born a slave in Virginia. He escaped to Boston in 1854. He lived and worked there for a few months before his former owner appeared and had him arrested. The trial of Anthony Burns triggered angry mobs in Boston, a city where most people were against slavery. He was forced to go back to Virginia with his master, but he later gained his freedom. Why was Anthony Burns arrested? He was born a slave. The angry mobs in Boston were against him. His owner was allowed by law to reclaim him. He was living and working in Boston. Jake's mother tells him to take an umbrella with him when he is leaving for school. However, Jake does not think it is necessary. What can you infer about the weather? It is going to rain. Justin grabbed the leash and quickly put it around Tooli's neck. He stormed out the door with Tooli coming right behind. He said, "Hurry up, Tooli. You're always so slow." Justin kept his head down and walked quickly down the road, not speaking to anyone that he saw. What was true about Justin? He was very worried that someone might see him. He was angry that he had to walk the dog. He was feeling sick and wanted to lie down. He was very excited and wanted to hurry. Read the sentence. Then choose the best inference. Mila changed her clothes about twenty times before her interview. Mila had lost a lot of weight. Mila was early for her interview. Mila couldn't find her suit in the closet. Mila wanted to make a good impression. Mahlia read a story about a man landing on a planet with aliens, and remembered that she had read an article in a magazine about space earlier in the week. What kind of connection is Mahlia making? Draw a conclusion from the sentences. Myles turned the switch on the lamp, but it did not come on. He looked at the cord and saw that the lamp was plugged in. What happened? The light bulb was bad. Myles flipped the wrong switch. Choose the clue that helps you draw the conclusion. CONCLUSION: The family's house is right by a lake. It was a hot and sunny day. My mom said we were going swimming. We left the house and walked to the boat dock. Glenda gave her grandson a warm hug every time she saw him. Glenda had a lot of money. Glenda was not feeling well. Sara was delighted when her brother gave her the teddy bear he won at the fair. Sara had been in an argument with her friend. Sara did not want to be at the fair. Joe is reading a book about a country in Africa. While he is reading, he thinks about a news story he just heard about that country. Mr. Hamil sailed from the harbor after the storm ended. Mr. Hamil was interested in weather. Mr. Hamil lived in the mountains. Mr. Hamil was on a boat. Hunter was glad his visitors were finally there. Hunter shut his curtains and would not answer his door. Hunter threw open the door and ran out to greet his friends. Hunter hoped he would have time to go fishing before dinner. You're reading a book about flies. You want to know how each type of fly compares to the others. You're browsing the Help Wanted ads to find a job. The job must pay at least $10/hour. When scanning the job ads, what should you look at in each ad before reading the rest of the ad? You're reading a chapter in your textbook to prepare for a test. What is the best thing to look for to find the most important information quickly? Gray is reading a book about rockets. He thinks that something he read contradicts a fact he saw in another book, so he makes a note to look it up when he gets home. You're skimming a book called "Plant Life" to see if it would be a good source for you research paper on how flowers grow. Where would you look to see if it has the info you need? Marshall is reading a book and notices that the main character's aunt is very similar to his Aunt Maria. You're writing a research paper about a particular general during the Civil War, but the book you have on the Civil War is huge. What is the best thing to look at to quickly find what you need? It's time to pick a book for silent reading time. You have a stack of novels in front of you. What is the best thing to look at to decide if the book will interest you?